Son of Donald and Maggie MacLeod, of 2, Habost Lochs, Stornoway. Malcolm was one of the children of Donald (1860) and Margaret (1855), the others being Ann (1884), Chirsty Ann (1894), Donald (1888), Farquhar (1892), Isabella (1899), Malcolm (1890), Malcolm (1897) and Roderick (1886). 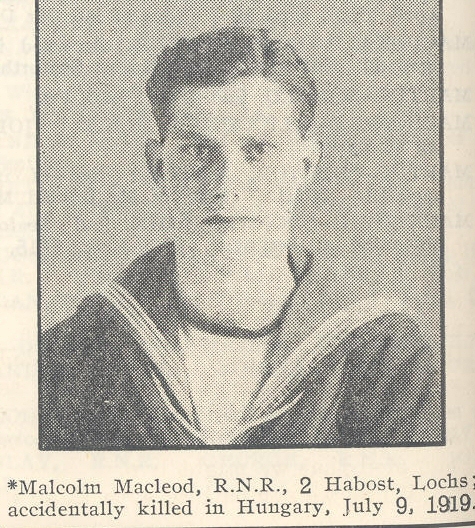 His older brother Malcolm was in the Merchant Navy; his brother Donald was in the Cameron Highlanders but was killed in 1915.